Connecticut Master Chorale - Joseph Jacovino, Jr.
Joseph J. Jacovino, Jr graduated from the Hartt College of Music with a Bachelor of Music degree in Piano Performance and from the Manhattan School of Music with a Master’s Degree in Music Education. He has just recently retired as the Music Director at Holy Cross High School in Waterbury, where he directed the concert band, jazz band, guitar ensemble, handbell choir, piano keyboard class, and taught music theory for 35 years. Since 2000, Mr. Jacovino has been the organist/cantor/choir director at St. Rose of Lima Church in Newtown, where he has conducted numerous concerts involving the St. Rose Festival Chorus and Orchestra. In 2005 the choir traveled to Italy performing concerts in Rome, Florence, and at the Vatican. In addition to his eighteen seasons as the Connecticut Master Chorale’s extraordinarily talented accompanist, he is currently the accompanist for the Collegium at the Taft School in Watertown, and the choirs at the Waterbury Arts Magnet School in Waterbury. This is also his twelvth season as the Music Director of the Waterbury Chorale, which is currently celebrating its 50th season. Mr. Jacovino has been an active piano soloist, having appeared with the Waterbury Symphony Orchestra, Naugatuck Valley Community College Orchestra, the Connecticut Master Chorale and Orchestra, and the St. Rose Festival Chorus and Orchestra. 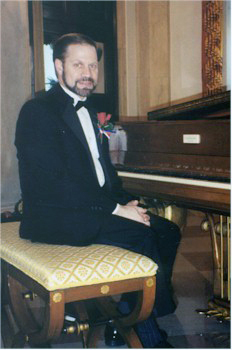 He has appeared in recital on numerous occasions as a classical organist and pianist. Joe currently lives in Middlebury with his wife Roberta, and son Jay. His daughter Sara is a professional trombonist/pianist/composer/arranger, living in New York City.